This is why I own a dual sport bike. The interesting stuff on this trip was all in an area we dubbed “3 Rivers”. Caney Creek Road turns to gravel and then it’s a mix of grass, rocks, and forest floor. There are three rivers that converge in this area and everywhere you look there was flowing rivers. It was beautiful! Our first section up into the gnarly stuff was mostly rocks. We were being bounced all over the place! Everything from small fist size rocks to large engine busting rocks. It was a good thing I recently upgraded to a steel skid plate. Picking the right line was important. We got through the first section successfully and we stopped to take a break. I wanted Stretch to try my new Pivot Pegz out so I suggested he take a ride on the ‘ole KLR. He suggested I try his DR. I was pretty nervous about that. See, Stretch is called Stretch because he is pretty dang tall and I am NOT pretty dang tall. His seat height was about 4 inches higher than my inseam so I expressed my concern about falling and he said it would be fine and we both actually expected it. I knew he geared it lower, but what I did not know is he had a quick turn throttle cam on it. I hopped on the DR and I was trying to take it easy, but I couldn’t keep the front wheel down! It was just bobbing and giving me very little control. I managed to go about 30 feet and I crashed it into a big rock. I felt like a huge turd about it. Anywhere else I could have dropped it and no damage would have been done. You can watch the whole thing unfold in the video. Afterwards, Stretch’s comment was “15000 miles and you do more damage in 30 feet.” I cannot tell you how bad I felt about that. Which is the road less traveled? We picked up the DR and swapped back to our own bikes and continued on. The scenery was some of the best I have seen on our rides. Butterflies were everywhere, the sky was blue with no clouds and we were getting to ride! We came down to this clearing where there was an old chimney still standing and we had our first water crossing. It was actually one of the deepest ones I have done and it felt cool to ride through that much water! 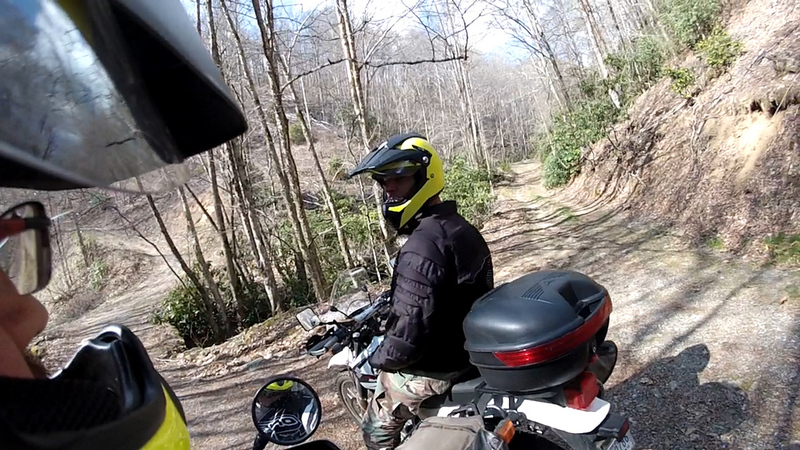 As we kept riding every trail seemed to turn into more trails. 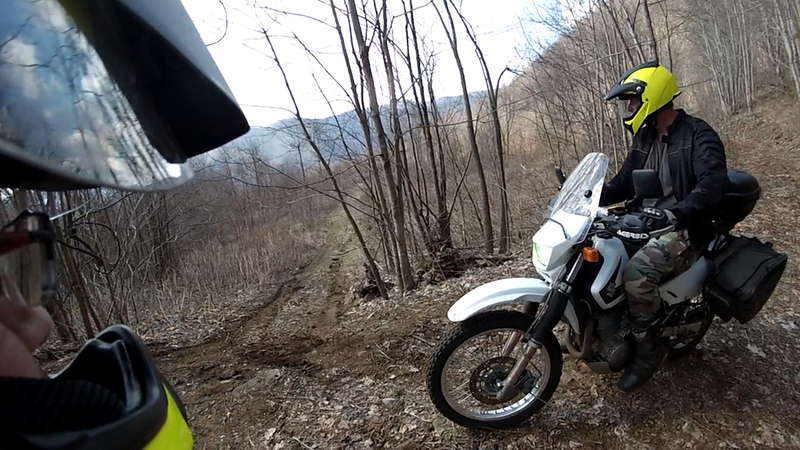 There was so much to explore and if you are a better rider than I on a good enduro bike there is even more to see. There were several trails that kept going, but our skill sets did not match up to the terrain. As we worked our way up to the top we found another interesting thing on some trees near the top. They were forest service bearing trees. Check out the pics. The afternoon was turning into evening and we needed to start heading back so we made our way back to civilization and more twisty roads to get home. On the way back we took a break at a local piece of history called the Judaculla Rock. There is a great story behind the artifact and the link will let you read it. Even the Cherokee considered this site ancient! After our break we hit the twisties again and it wasn't long before we were behind a pickup truck full of teenagers on spring break. The cab was full and so was the bed of the truck. They were waving at us and joking with us going down the road, but the funniest part was when one of the guys pulled his shirt up to flash us as we past. I wasn't expecting that, but it was pretty funny. Ah, to be a crazy teenager again. All in all Stretch and I had a great time. I got to put my first good gouge in my skid plate and we found an excellent place to explore. I also got to try out my new Wolfman luggage and build some rock riding skills. Quick turn throttle cams will get you into trouble. Pivot Pegz are worth every penny. This verse applies literally to our little trip into the forest. When I wrecked Stretch’s bike I felt horrible. Stretch was cool about the situation and like any good friend gave me a hard time. He told me not to worry about it, but I couldn't shake it. I had to try and make it right. I figure the next time we ride he will be showing off his fancy new upgraded plastic tank and that makes me feel much better. I am glad to have good friends and cool people to ride with and I want to keep it that way! So, how about you. Have you ever borrowed something and damaged it? How did you handle it?